The dream has finally come true. 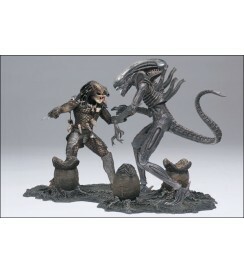 After years of pursuing these licenses, McFarlane Toys was able to land both of them in one fell swoop. 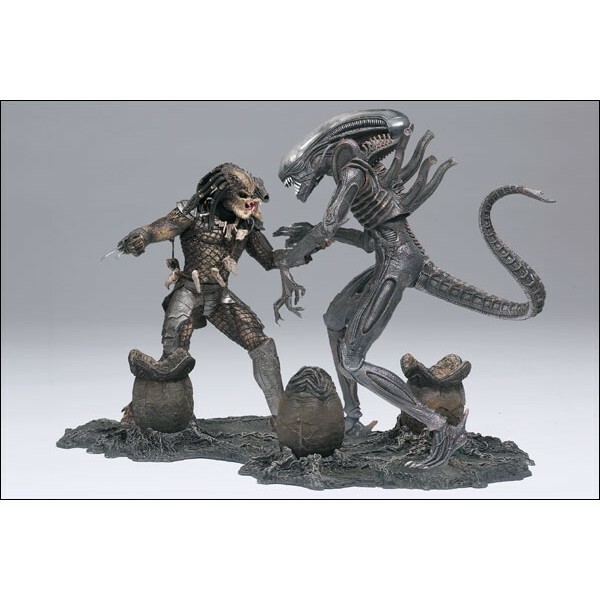 That's right: Alien AND Predator, two of the most highly requested figures in the history of our company. To celebrate, we're packaging the two incredibly detailed figures together in a deluxe Movie Maniacs 5 boxed set along with a custom display base. Alien is based on reference from the original Alien film and Predator is based on the initial Predator movie. Teeth, teeth and more teeth. Beginning in an alien egg pod and grown within the confines of a human host, Alien (from the original 1979 Ridley Scott film) is ready to feast and incredibly difficult to kill. Like an expensive intergalactic hunting trip, this alien hunter, the Predator, has come to earth to stalk big game and take home trophies of his kills. And the best hunting target of all? Man. Alien Height: 8 inches. Alien Articulation: Neck (ball joint), shoulders (ball joints), biceps, elbows (angle joints), wrists, midsection (ball joint), tail, hips, thighs, knees, ankles (ball joints). Total of 19 joints. Alien Accessories: Fully bendy tail, removable brainpan helmet, full custom diorama base with light-up eggs and face-huggers, spring-loaded mouth play action. Predator Height: 7 1/4 inches. Predator Articulation: Neck (ball joint), shoulders (ball joints), elbows (angle joints), wrists, waist, hips, ankles. Total of 12 joints. Predator Accessories: Shoulder-mounted laser cannon, string of trophies, full combat armor, full custom diorama base with light-up eggs and face-huggers, spring-loaded forearm-mounted blades.